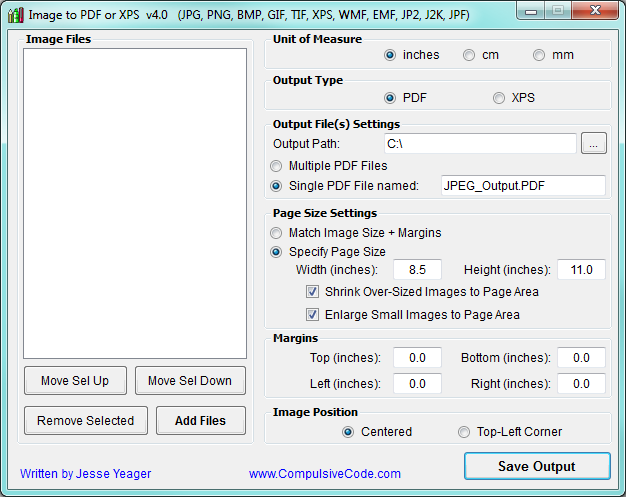 This is a program for converting image files into PDF files or XPS file. The program supports converting multiple image files to single or multiple PDF / XPS files. The program also supports image scaling and positioning. The program now supports XPS input and output. The program now supports LST and CBZ input. Requires Microsoft .Net Framework 3.5. Requires Microsoft Windows Vista or later for converting XPS to PDF. 02-12-2019: Fixed an issue with XPS creation. 12-27-2018: Removed some unnecessary low-level API functions. Considering rearranging the UI, maybe adding a tab for Advanced options such as page numbering, adding the file name as text, re-sampling, 12-24-2018: Added basic support for .CBZ files. .Net framework version increased to version 4.5 to accommodate CBZ archives. 11-29-2018: Added support for TXT list files. .TXT and .LST files will be treated as file lists where each line is an input image file. Added "Move To Top" and "Move to Bottom" in right-click menu. 10-31-2018: Added new right-click menu code. Added new menu item "Clear All". Added Ctrl+A to select all list items. Added Ctrl+F to clear all. 10-21-2016: Added some error handling for EXIF tag processing. 07-29-2016: Modified file creation routines to correctly specify security attributes in x64 environments. 07-28-2016: Added support for EXIF orientation tags in JPG files. 06-02-2016: Added the ability to save output files to the same folder as the input files when writing multiple output files. 05-30-2016: Removed unused test code from the program as it was causing false-positives in some online virus scanners. 05-19-2016: Added support for writing .XPS files. The program does NOT support converting JP2/J2K/JPF to XPS. Renamed program ImageToPDForXPS. 03-24-2016: Added support for reading .XPS files as images. Had to raise the .Net Framework version from 2.0 to 3.0 01-12-2012: The program now allows dropping a folder onto the list. The folder (and subfolders) will be scanned for images. Fixed a bug with processing some GIF files. 10-17-2011: Modified the command-line support to accept wildcard character asterisk in input specification. Example: JPEGtoPDF.exe "C:\Output.PDF" "C:\Images\*. *" 10-09-2011: Fixed an issue with conversion to a single PDF, which would limit the PDF page size to a max of 17"x17". 09-02-2011: Fixed a setting not saving correctly (saving opposite) for page size (image size versus specific size). Minor fixes. Conversion might be a little faster now. The file list does not allow duplicate entries. Perhaps this should be changed.. 08-22-2011: Fixed the "Browse for Images" dialog not matching image types with their extensions correctly. 07-28-2011: When determining the number of pages in an image, .JPG files (and all variations) will be treated as single-page images. 07-19-2011: If the program is saving a single PDF, and that filename does not end in .PDF, the program will now automatically add the file extension. 07-15-2011: Added support for Windows 9x. 06-08-2011: Added buttons for Move Selection Up, Move Selection Down. Fixed one line that was missing a condition for .JPF files. 05-13-2011: When saving as a single PDF file, the program will now check if the output file already exists, and will prompt the user to overwrite the file. 04-13-2011: Added support for .JPF files (an extension for jpeg2000 I was not aware of). The program now correctly retrieves the resolution setting in .JP2 and .JPF files. 03-22-2011: Fixed a bug in the folder validation/creation function, which may have only affected some versions of Windows. 02-28-2011: If the specified output path does not exist, the program will now create it, instead of failing to convert. 02-25-2011: Added an option to enlarge images to fill the page area. Cleaned up some file permissions (only opening the image files as Read-Only, in case they are open elsewhere). Added some better error-handling for situations such as Could Not Create/Overwrite PDF file (because it's probably open in Acrobat). 11-22-2010: Removed a .Net 2.0 SP2 dependency. So now the ServicePack2 is no longer required. Fixed a bug in JPEG2000 to PDF conversion. 07-02-2010: The command-line interface now returns an exit-code. 0 for success, 1 for failure. 06-26-2010: The program now saves and restores the settings. 05-19-2010: Added support for converting multi-page images. 04-15-2010: Updated code to support files larger than 2gig. 02-26-2010: Files dropped onto the list will now be sorted before being added to the list. 02-22-2010: Added options for Units of Measure. The program now supports Inches, Centimeters, and Millimeters. The 'Browse for Folder' window now contains a 'New Folder' button. 02-19-2010: Changed the default output path from C:\ to the users Desktop folder. The interface can now be resized. When writing multiple PDFs, the original image extension will now be preceded by an underscore, instead of a period. 02-18-2010: Added support for unicode filenames. Rewrote the CommonDialog code using managed .Net objects. Cleaned up the interface a little, to fix font issues with Windows 7. Added a 'Clear List' option to the right-click menu. Added .EMF and .WMF to the supported file types. Previously: Added support for image formats other than JPG. Rewrote the program in VB.Net 2005.